As you must have noticed, managing documents in Dynamics 365 CRM on Cloud Storages is yet to evolve. 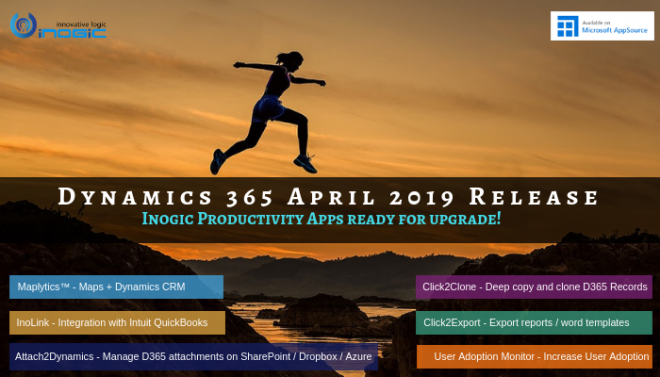 SharePoint is the only Connector with native integration in Dynamics 365 CRM however, there are not many functionalities that are inherently supported in this integration. Besides, wouldn’t it be an optimum solution if multiple Connectors could be supported with Dynamics 365 CRM and save Dynamics 365 CRM space? With our new app Attach2Dynamics, this requirement is realized! Yes! Attach2Dynamics, our power tool, for management of Dynamics 365 CRM documents on SharePoint and Dropbox has been launched! A token of gratitude goes out to our Partners, Peers, Microsoft experts and Customers who have been our constant companion all along the journey. Inspired to bring another revolutionary tool, we have developed this solution exclusively for our Dynamics 365 CRM users. Since our inception, we have always endeavored to optimize your Dynamics 365 CRM experience and this tool just amplifies the same you. This extensive productivity tool, embedded in Dynamics 365 CRM, enhances its functionality in multifold. Get acquainted to this exceptional tool by attending this live webinar. Our team of Solution Experts will guide you step by step through its functionality. We are also under development phase to support Azure Blob Storage, One Drive, Box and Google Drive storages in future. ‘Drag & Drop’ multiple files and folders to cloud storage of your choice. ‘Upload’ multiple files and folders to SharePoint and Dropbox. ‘Download’ Multiple Dynamics 365 CRM files/folders from cloud storage of choice. ‘Move Notes’ to one of the Cloud Storages for Configured Connectors. ‘Email’ Dynamics 365 CRM files as attachment or file’s link. 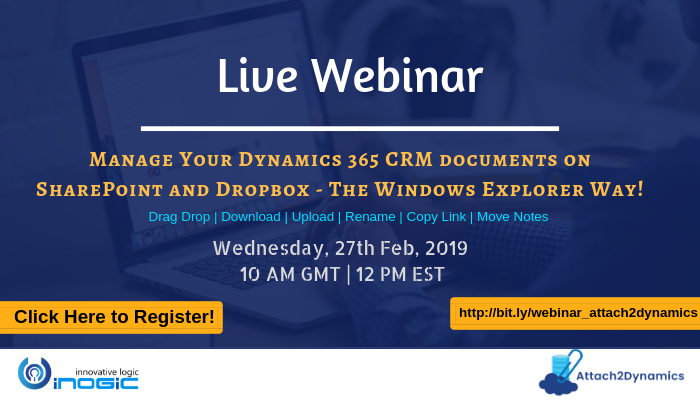 ‘Copy Link’ of the document location to be sent outside Dynamics 365 CRM environment. ‘Rename’ files and folders based on your business requirement. ‘Deep Search’ the documents till the last file/folder in a path. This is not it! We have many other features which we will cover in this webinar. Isn’t this thrilling? Rest assured, we are confident you are going to have a great experience! Cannot attend live? You can still register, as we will be sending out the recording to all the registrants!